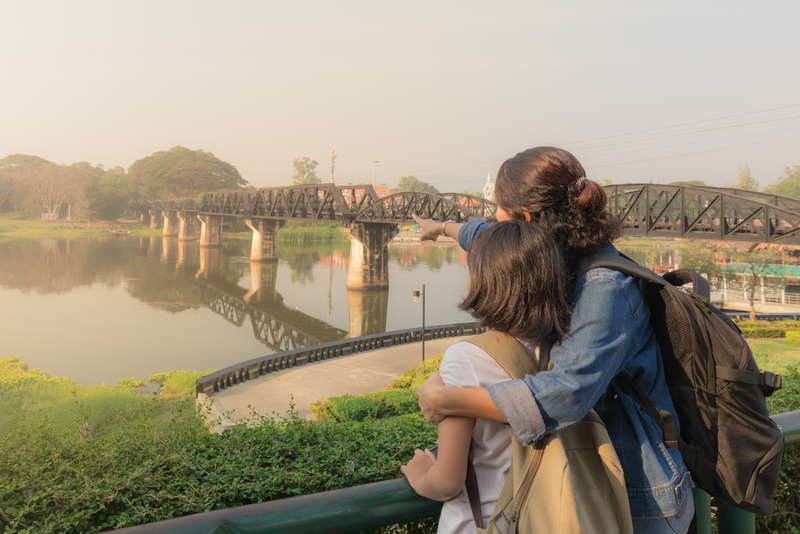 For partnered travelers, illnesses and other emergencies are difficult, but for Solo Moms without a safety net, they can quickly become catastrophic. Intrepid by nature, and no stranger to traveling as a single mother, I thought I knew how to deal with any difficult travel situation that came my way. It came as a shock, then, when I found myself so ill during a trip to Peru with my teen daughter that I could barely book flights to head home early. In short, although I knew how to roll with the punches, I still needed to have a safety net. And then I learned the same lesson a second time, after contracting an illness in Cameroon. Let me back up. Four years earlier, I took my then 10-year-old daughter on her first international trip. We flew from New York City to Iceland, where we boldly hiked over a mountain, rested in warm geothermal springs beneath the cool midnight sun, and headed down into tunnels that had been carved by lava millions of years ago. After Iceland, we adventured across France and Switzerland before taking a train to Italy. Our first night in Venice, in a small apartment overlooking one of the winding, thin canals below, we were eaten alive by fierce, tiger-striped mosquitoes. Aside from our bites, I thought nothing more of the mosquitoes until—10 days later—I got sick during an overnight bus ride from Spain to Portugal. By the time we arrived in the morning, I had what I thought was the flu. Sick as a dog and unable to leave the house we had rented for a week, I soon learned that I had contracted chikungunya, a dengue-like, mosquito-borne disease. I fretted that we might need to leave for home early, particularly as I was rapidly running out of money as I waited to get paid for a freelance job. But then, one day, the fever broke, my symptoms lessened, and I realized that I was well on the road to recovery. As miserable as I was, at no time did I feel concerned about our safety. Before we left New York, I had purchased travelers insurance through a carrier called World Nomads. Despite feeling horribly ill, I had complete command of my faculties and felt that if things went wrong, all I had to do was place a call to my insurance carrier if I had truly needed assistance. That isn’t, of course, what ended up happening to me in Peru. Midway through a two-week trip to an ecolodge near the Amazon River, I received hundreds of nasty bites on my legs from small sand flies. By the end of the trip, I contracted a horrible stomach parasite that left me completely incapacitated. Unlike when I was in Portugal, I couldn’t just wait out my illness. The bites on my legs were festering, and I was violently sick. On top of it all, I received an e-mail from my child’s doctor back in New York City. The lab results for a blood test that she had taken before leaving for Peru had come back positive for Lyme disease. My kid needed to return immediately to the States for treatment, but I had become so dehydrated that I could barely function. In other words, I needed help. Fortunately, I had planned to travel for the next few weeks with a friend. While I navigated my illness, she ensured my daughter was safe and fed, helped me pick up the antibiotics I needed, and, when things got really bad, waited on hold with airlines and my travel-insurance company to book new flights home. It all worked out, and within a couple of days, I was heading home. Over the next couple of months, I had a lot more travel I needed to do for work. I spent three weeks in Cameroon. Not quite over my illness from Peru, and with a compromised immune system, I quickly caught a cold. Panic washed over me: I was staying with friends, but I was 10 hours from the closest airport, and I had neither a working phone nor a steady connection to the Internet. If I grew too ill, what would I do? I had travel insurance, but how the hell could I use it from where I was? I survived, but barely. Back in New York, I ended up in the hospital with pneumonia. I had pushed myself too far and didn’t head home soon enough. It was there, from my bed in an intensive-care unit, I realized that although purchasing travel insurance could be part of my contingency plan, it couldn’t be my entire contingency plan. In Portugal, Peru, and Cameroon, I had been lucky that nothing worse had happened to me and blessed that I hadn’t put my daughter in harm’s way because of my stubborn intrepidness. I vowed: never again. This past winter, during a monthlong trip to Guadeloupe, my daughter contracted a virus that laid her out for weeks. This time around, I was prepared. Before we left New York, I researched Guadeloupe’s medical system and grilled my local friends for information about where they go when they’re ill versus for a medical emergency. How much cash would I need on hand to pay a doctor? Who could drive me to receive care? Where was a working phone, and where could I—at all times—reliably connect to the Internet? I answered each of those questions and also made sure that, if needed, I had enough money in my bank account for emergency flights home. I had always traveled with a printout of my travel insurance, but now I made sure to write down the steps I’d need to take for placing a claim. I also made certain that at least one person knew my emergency contact information. Finally, I wrote down a list of all my information, in the language spoken where I was visiting (in this case, French), including my name; emergency contact in New York; emergency contact in Guadeloupe; travel-insurance information, telephone number, and e-mail; and details about what should happen with my daughter should the worst ever happen. In short, I became an expert not in preventing disaster but in mitigating the effects should a disaster occur. I suppose all travelers should plan in case of an emergency, but people traveling solo, and single mothers like me, should take extra precautions and come up with a solid plan B. I learned the hard way that one should be more than just intrepid, and right now, as I start to formulate a slew of future travels, I plan on having more than luck on my side. Do you have any Solo Mom travel tips to share? Want more information? Join our community to ask other Solo Moms about their experiences. Melissa Banigan is the founder and CEO of Advice Project Media, a nonprofit that offers media, writing, and travel services for youth and teens around the world. She is also a freelance journalist whose work has appeared in many news outlets including the Washington Post, the BBC, and NPR, among many others, with work forthcoming in National Geographic.